WintersGrass Farm is owned by former Polyface apprentice Jordan Winters and his wife Hannah. Jordan is a native of New York and was raised in the Utica area. After apprenticing under Joel Salatin for a year in 2006, Jordan returned to the Mohawk Valley and started WintersGrass Farm to provide grassfed and pastured meats to the local area. In 2012 Jordan managed Maple Hill Creamery's 100% grassfed dairy farm in Little Falls NY. 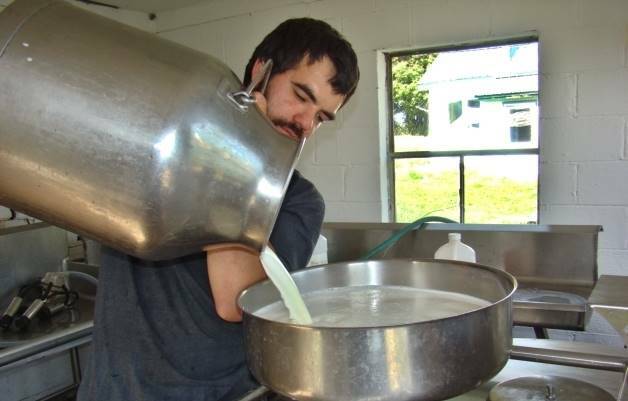 While the owners decided to sell the dairy in 2013 in order to be able to focus on the creamery which was building momentum, this was the experience that got Jordan started down the raw milk path. The following year he spent working with a friend in Virginia providing raw milk through a herdshare contract to the local families and raw milk enthusiasts. Hannah grew up in Minnesota on her dad's small hobby farm. In 2014 she married Jordan and made the move to New York. With her love for cold, snow, Jersey cows, raw milk, and home grown food, she's become an important part of WintersGrass farm. In 2015 Jordan and Hannah leased their current farm just outside of Utica NY where they are continuing to provide the local community with access to 100% grassfed and pasture raised meats and milk. As of April 2016, the farm has become the first and currently only NYS Licensed raw milk dairy in Oneida County.